We’re well into May already – isn’t the year flying by? But one of the best things about the weeks going so quickly is that it never seems long until it’s almost time for our next Fab Friday & Super Saturday weekend! Friday May 25th and Saturday May 26th are the dates of our next special weekend. We’ll have our usual great range of special offers on products, treatments, and therapies. There’ll also be free consultations and expert advice on some of our newer products. Reflexology – Just €25 for a 40-minute session. Call (053) 923 6009 to book. Psychic Readings – With Michael Doyle. Just €25. Call (053) 923 6009 to book. Mega Test – Checks for yeast infection, digestive enzymes, worms, and dairy, grains, sugar, vitamin & mineral deficiency. Just €20! Call (053) 923 6009 to book. Indian Head Massage – Just €25 for 40 minutes. Call (053) 923 6009 to book. Joint Pain – Free consultations and special offers on a range of products. 20% off Eskimo 3 Omega 3 oil. 20% off Zerochol natural dietary supplement. Phone Radiation Barriers – Information Days, and special introductory offers. Anti-aging Natural Facelift Massage & Facial – Enjoy two great treatments for just €50! Call (053) 923 6009 to book. Cholesterol Test – Just €10! Call (053) 923 6009 to book. Get ready for Summer with a gentle Body Detox and Dry Skin Brushing. Includes skin brushing, exfoliating, face mask, and hand & foot massage. All for only €35! Call (053) 923 6009 to book. Rolfing Therapy – With Mary O’Leary. Just €25 for 40 minutes. Call (053) 923 6009 to book. 2 for 1 Allergy Test & Nutritional Consultation – Just €50. Call (053) 923 6009 to book. 25% off Quinton Hypertonic – Enjoy the benefits of the natural goodness of sea water. Plus expert advice from cell nutrition expert, Laura. 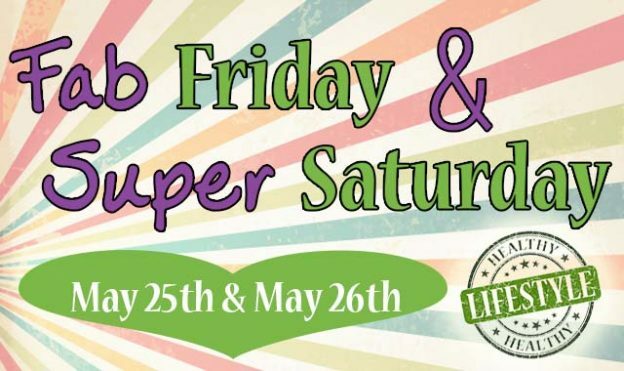 You can see we’ve lots on offer on Fab Friday May 25th and Super Saturday May 26th – so don’t miss out. We look forward to seeing you!